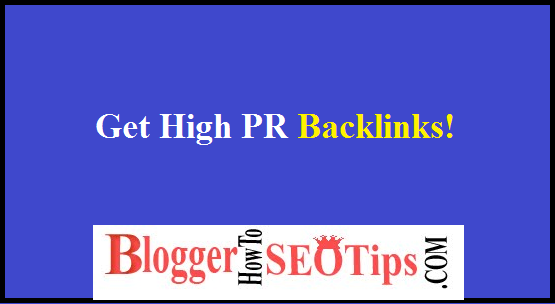 High PR means page rank quality backlinks are amazing way to get good rank in search engine result pages for your blog, but it is really difficult for newbies to do it effectively the reason is simple because there are many people provided information, most of them are extremely outdated and almost not working these days. So, if you are newbie and started a blog, then here in this article I am going to share with you step by step guide for getting high quality back links to your blog and that's why your blog posts and of course your blog too appear on the top. So, are you ready to get started and take action, because only reading this article is not going to help you to get good rank but also you need to take action and just follow my instruction and there you go. So, here I am going to share with you step by step guide for getting back links to your blog, see getting back links from website like Google, Facebook, Youtube, Twitter and of course from Pinterest is awesome but if I will tell you there are other websites from you can also get back links. Is not that awesome for you, I know you are feeling happy because finally you have landed on the page from where you can get and implement something in your blog. Getting back links from Google is easy but for this it is necessary to have Google Plus account I must say almost every blogger have Google Plus account, because it is having numerous advantage, so here are steps for getting back links from Google Plus. Step 5: Then you will find out story just on that widget portion you will see edit option click there and write about your own story and you can also give own anchor text and link to the web page, that is depend on you. Step 6: And after adding your blog link just click on save, that's it you have successfully get one strong backlink from high PR website. Note:- There you will also find out a tab name as links you can also add links according to your requirement but don't try to spam, just add what you are offering. Like the same here, I am going to share with you step by step guide to get back links and of course there is unlimited potential to get traffic from Facebook & make money on Facebook, I came to know about it from Alexa Tool, just search any popular blog in any niche you will find good percentage of visitors are coming from Facebook, which shows the potential this website have to get flood of traffic. Step 4: Get your cursor on your date of birth then you will see option "edit your contact and basic info", just click there and then there you go. Step 5: Now find out option "WEBSITES AND SOCIAL LINKS"
Step 6: Now the very first option for adding your blog URL just get your cursor on the right side, there you will find out option edit, click there and then you can add as many blogs you wanted to. Note- Another effective way is there to get back link that is through Facebook page, need to create a Facebook page around your blog and add there your blog URL. This is one of the amazing way to get back links from Youtube, even I got from this website, because as you know this is world first search engine to search videos. Right, may be you are aware about it. Step 3: There you will be asking for setting profile name for the Channel, if you did not have channel earlier. Step 4: Now you need to upload a video to your channel and there you need to add links of your blog on the description page. Note:- Don't build backlinks to home page of your blog, build backlinks to the specific page. Here, I am going to share with you list of websites, from those websites you can get backlinks and of course that will be natural, most important my dear, don't try to get backlinks in a day, take time and then build slowly, which will be the best practice for you. Okay, that's fifteen backlinks you are going to get from my source only, but dear one of the biggest mistake may be you are going to make that is tried to get all in a day. And expect to get result in a day. I will tell you to get two links in a day and don't try to get result in a day even in a week, at least wait for a month, sometimes it takes more than month, because its white hat, so it will take time to get good rank. Actually, couple of days ago I have build a city portal and I got sponsored for building the portal that's why I have hired an assistant for arranging content for the portal. Within just few months, it is ranking super, I am really happy after looking at the result and it happened with these backlinks only. So, are you ready to know the biggest mistakes I did while building back links to my niche blogs, well in the earlier days I have tried to build lot of niche blogs starting from blogspot blog and make money too. But, did the same pretty mistakes, because of that mistake I loss lot of money because I was unable to rank the blog post on the top, do you wanted to know that mistake. I think you wanted to know, right. So, here is the mistake made, I did not build back links to my blog post, I was building link to my blog home page. That was one of the blunder mistakes, I made, well right now I am working on a BIG Fat Niche blog, which will make me lot of money, because right now I am putting my whole effort to make that niche blog successful and then I am sure my next BIG BIG Fat project will be awesome. So, I will suggest you not to repeat such mistake. Create profiles on social media and put links there. Upload videos related to the same content in the article and then add that video to the blog post as well as put the blog post link in the description page of the video. Backlinks are good but you need to have natural, but yes you can get backlinks without putting lot effort it is easy to get backlinks from social website and get good traffic too and most important thing is that content you have in your blog, if you have great content then you need to put little effort to get backlinks. So, what do you think about link building?